Members of the rightist group Irgun Matot Arim, protested Monday outside the Arison Hall in Tel Aviv against the play "Hebron," claiming that it "serves Hamas." The activists claimed that the play, co-produced by the Cameri Theater and the Habima National Theater, "is about 'bad' IDF soldiers who abuse supposedly 'peace loving' Palestinians, who in actuality carry out suicide bombings against us on a daily basis." 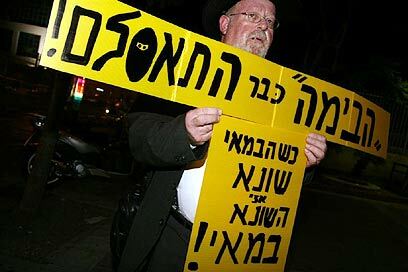 Protesters: "Habima is Hamas' national theater"
funding to the company should be stopped, and the theater's management should be directed to the elements who sponsor the PR of the global Islamic terror movement," they added. Susie Dym, a spokeswoman for the organization told Ynet, "The protestors are people who support the settlement in Hebron and the IDF's activity in the region. We think that there should be a limit to how often you can shoot yourself in the foot. We must understand that the Palestinian propaganda machine never rests." Dym confessed she hasn't watched the play, or read it, but said that the reviews in the newspaper were enough for her. "The producers' intentions are clear. These are twisted people who ignore the facts and believe that the Palestinians are the most miserable people in the world. There's nothing wrong with weirdos, but here we're talking about weirdos who endanger the country and undermine its image abroad." Ahead of the play's opening, security in the theater was boosted to prevent any interruptions. Habima's artistic director Ilan Ronen told Ynet, "I hope that everybody understands that a national theater should enjoy artistic freedom that would allow it to stage a varied repertoire, including criticism against the reality we live in and the Israeli-Palestinian conflict. "I think that the play's greatest virtue lies in its human dimension and the attempt to portray the Jewish and Arab victims, and especially their children, who suffer from this endless cycle of violence. In the end, neither the Jews nor the Arabs come out clean from this play. This is not a play of black and white, and there are no good guys or bad guys," he concluded. "Hebron" is Tamir Greenberg's debut play, and it features the bloody struggle between Israelis and Palestinians in Hebron. 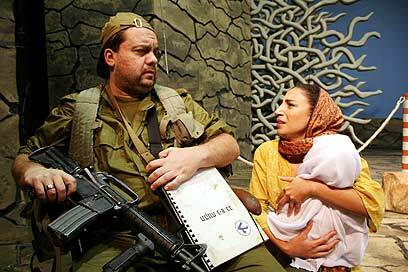 See all talkbacks "Israeli play 'serves Hamas propaganda' "